Ok, I am trying to teach myself HTML codes & stuff like that. I was trying to figure out how people made their pics (and banners) links. 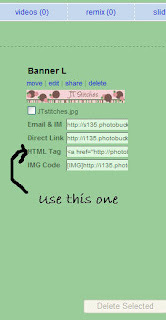 I will try to explain how I do it....I use Photobucket. I upload a picture to my Photobucket album. 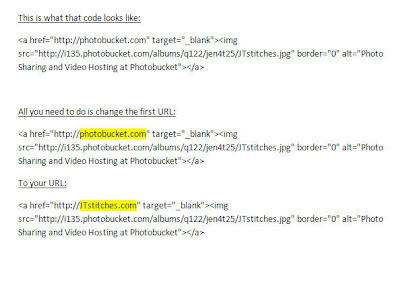 Photobucket has all the codes underneath, use the one "HTML Tag" like below. I'm not really sure how to do it for a blog like this one, that's why I had to show you the above directions as a picture, it wouldn't allow me to post the codes & 'publish post". I will try & see if I can figure out how to do it for blogger but this will work for Myspace & websites. Thanks very much for posting, extremely helpful!